It's now August, what I always consider to be the peak month of the summer, and I'm getting excited for the upcoming Victoria Electronic Music Festival this weekend. 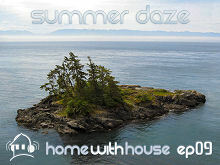 So I decided to make this month's Home with House podcast a special 2 hour long mix to get pumped up for the festival. Home with House episode 09 has a warm summer feel to it, and is full of funky, vocal, and disco house. This mix is called "Summer Daze". What can i say, long time since i heard Dajae and Full intention (ahhhhh good times) and still an all time fave of mine that captures a feeling in a flawless mix. 2 hour mix? You're the Juggernaut! I'll be downloading this mix when I get home. I don't get to sit around listening to music all day like some. Loving your latest mix! This is exellent and exactly my taste! I'm the newest subscriber to your podcast mate! Cool thanks SD, glad you liked it. Your site seems interesting, and so does the latest mix listed there. I'll give it a listen later this weekend. Cheers.